Main site > Forums > MoneySavers Arms > The Money Savers Arms > Would you wear Crocs to an official function? Results: Do you own some of these / where would you wear them? Would you wear Crocs to an official function? Here's a picture of a pair of Crocs - the same company also produce several other versions along the same lines. Would you wear something like this to an official function? Would you wear socks with them? Are they preferable to UGH boots? Crocs - for those occasions when Ugg boots just aren't ugly enough. 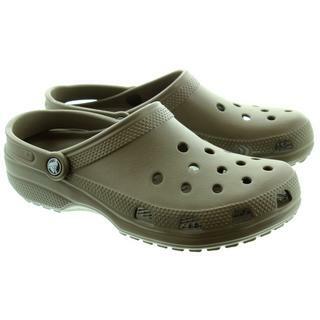 Sorry but Crocs are uglier than Ugg boots. They just are. Ghastly things, I wouldn't wear them anywhere. I wear a pair as slippers, purely because I trash £15 slippers within a matter of weeks, but these seven quid "beauties" ( ) last me around 5 years or more. They call me Dr Worm... I'm interested in things; I'm not a real doctor but I am a real worm. I own several pairs, bought the first pair in 2008 when I was in Florida and had worked up massive blisters walking miles in 90+ temperatures. I was struggling to find anything comfortable enough that would fit my feet with the dressings on and had seen many many people wearing Crocs. None of them seemed to have sore feet so I tried a pair and they were soooo comfortable - I was a convert! I have a pair myself. I Bought them (the real McCoy) at a reasonable price and have also worn them to the shops. I wouldn't wear them to a wedding or funeral though. I've got some proper ones, and some Lidl ones. They're all pretty comfortable. The proper ones are best though. I'd wear them anywhere if I thought it'd p the sartorial police off! I've been wearing Crocs in different forms for many years. My second pair, a black pair like the ones in the opening comment I bought to wear to my ex's funeral. No-one noticed, they weren't looking at my feet. And he would have found it very funny! Yes I wear socks with them, they keep my feet from sweating too badly. I have a bright pink worn out pair with fur in them that I wear as slippers, a plum coloured new fur lined pair which will take over from them in the autumn, a red classic pair for summer wear and my black bistros (which my physio won't let me wear for work anymore ) they are made for kitchen work (which is what I do), with a non-slip sole and a smooth, unholey top surface to protect your feet. With a wipe over with a damp cloth they are perfectly respectable enough to wear to a funeral or job interview with a pair of trousers. And I don't like UGGs. I don't own any, and have no intention of ever owning any as I don't like them. I can't imagine anyone wearing them to any sort of function. Lidl ones for going out to the line. I usually forget, though, and go out wearing my slippers. Cheap copies for the garden. Wouldn't wear them beyond the gate unless an emergency like running into the road to a car accident. Popular with hospital staff I gather. Don't know if UGG even make boots in male adult sizing? Me no likey the look of crocs!